GILGIT: The continuing Shisper Glacier surge and subsequent creation of a dammed lake has created the fear of another Attabad lake-like disaster in Hunza. An assessment report prepared by the Gilgit-Baltistan Disaster Management Authority (GBDMA) has warned that the dammed lake might burst any time and cause immense damage to the local people, critical infrastructure and installations situated downstream. The Shisper Glacier, a few kilometres from Hasanabad village in Hunza, started to surge in May last year. 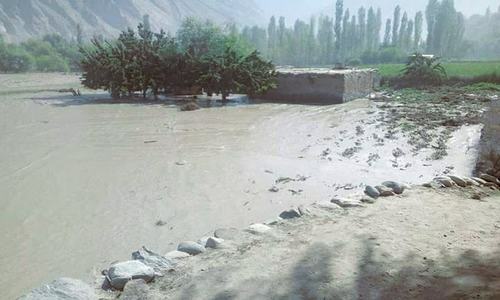 The unusual surge has blocked water flow from a stream originating in nearby Muchuhur Glacier, which normally falls into Hunza river at Hasanabad, thus forming an artificial lake. A GBDMA official told Dawn that expanding day by day, the dammed lake was now spread over 700 metres, with a depth of 300 feet, and the glacier was surging at a speed of seven metres per day towards Hasanabad. 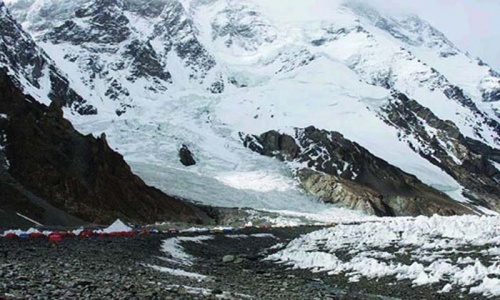 The official said that according to the GBDMA assessment, the possible lake burst had the potential to submerge a portion of Karakoram Highway, a bridge, over 100 houses in Hasanabad, two powerhouses, a Frontier Works Organisation (FWO) camp office and hundreds of kanals of fertile land, while it might block the flow of River Hunza also. He said that the GBDMA was monitoring the glacier surge and the dammed lake on a daily basis and experts had visited the area and assessed the possible damage in case of the lake burst. He said an early warning system had been installed in the area with the support of satellite cameras and local residents had been advised about measures to be taken in an emergency situation. He said that the experts feared that if the glacier surge continued at the present speed, it might hit 2MW Hasanabad power station downstream of the glacier in two weeks. Meanwhile, a meeting held at the Chief Secretary House in Gilgit on Saturday discussed steps to be taken to cope with any emergency, said a press release. The meeting was chaired by GB Chief Secretary retired captain Khurram Agha and attended by officials concerned. The meeting was told that during the coming summer season, the speed of glacier melting and surging of the lake could trigger a disaster. However, the GBDMA had evolved a mechanism to cope with any emergency. It was told that the Army had conducted a survey in the area and, after completion of data processing, a report would be sent to the authorities. 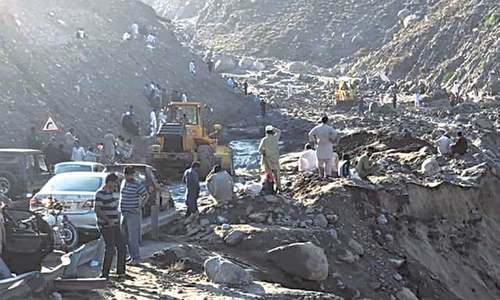 The chief secretary directed the GB works department to erect protective walls along Hasanabad Nullah by Feb 15 to protect houses and installations situated along the stream. The food department was directed to store food and medicines for five months in the upstream areas. The chief secretary asked the National Highway Authority to take measures to divert vehicular traffic from the area if Hasanabad bridge on Karakorum Highway was submerged. An alternative bridge would be constructed by the FWO. The meeting constituted a committee, headed by GB Home Secretary Jawad Akram, to review the situation and send recommendations to the chief secretary. The committee was assigned the task of proposing measures for evacuating affected people in case of an emergency. Meanwhile, the residents of Hasanabad have expressed dissatisfaction over the measures taken by the administration to protect local people and infrastructure in case of an emergency. The Hasanabad Youth Organisation president Tariq Jamil said that the situation was alarming in the area, but the administration was not serious about protecting the vulnerable. He said that no steps had been taken to protect the locals in case the lake burst. “The surging glacier is merely five kilometres away from Hasanabad,” he said. A possible lake burst could submerge houses in the village and also block flow of Hunza river, creating an Attabad lake-like disaster, he feared. Amjad Hussain, a social activist, expressed similar views and said that the early warning system was not effective and no resettlement measures had been taken yet. He called for emergency measures to protect lives in the event of an unforeseen situation. There’s an expensive phenomenon to refreeze the glaciers, and UK has speciality in this field. If you have money you can do it. I visited the same place last summer and had cherries with my friend Masood Ali Khan at his orchard. @Junaid Kamal, is there any need to share your personal experiences here? why waiting for the lake to burst by itself? why not the administration or the GBDMA take early steps to cope with the issue? isnt there any possibility to make a leakage for the water to pour out at a slow pace...or just blast the glacier after making proper safty arrangements for the nearby people and their property. Being a resident of this area I have witnessed myself the surge in the glacier, and lake formation towards Muchuwar nallah. GBDMA and local government seems clueless about the situation. No evacuation plan is shared with the people of Hassanabad, I am afraid they don't have one themselves nor they are planning to make. 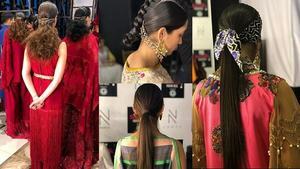 Secondly, the case of Attabad is different. I hope NDMA and GBDMA will invite some experts for consultancy on the situation.